PORT ALLEN, La. 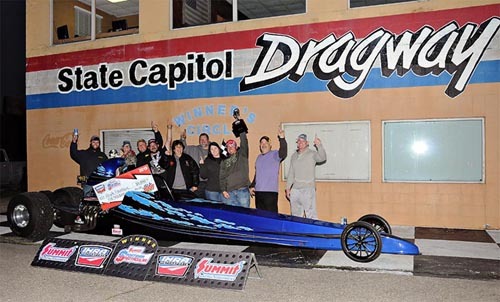 - Heath Fountain was the weekend's biggest winner at International Hot Rod Association (IHRA) Summit Sportsman Spectacular event at State Capitol Raceway. With the events tailored to each of the host tracks, Fountain won the $5,000-to-win Super Pro division during Battle Born Batteries Sunday. He also received a $500 certificate towards the purchase of Battle Born Batteries products. It came one day after rain halted action in the Super Pro and Mod divisions during Moser Engineering Saturday and the prize money was split after round three. Sunday offered a new day of racing and Fountain was quick at the starting line. The Deville, La., driver had a .007 reaction time and raced down the track in 4.921 seconds at 134.85 mph. Runner-up Wayne Henry from Central, La., was .020 at the start before a 4.829-second run at 139.34 mph. Larry Seguin from Greenwell Springs, La., earned the $2,500 winner's purse for the Mod division, plus extra bonus money as an IHRA member. He went down the drag strip in 6.222 seconds at 107.87 mph after a .029 reaction time. Runner-up Cody Pollage from Plaquemine, La., was the No. 1 qualifier and then had a final-round package of a 7.230-second pass at 94.09 mph, paired with a ..012 reaction time. 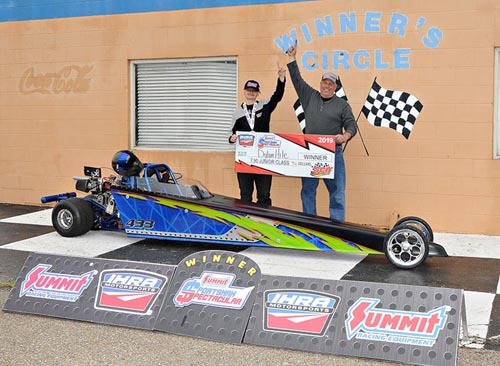 Three divisions of Junior Dragsters were contested with Dylan Hite from Prairieville, La., winning in Masters when final-round opponent Velicity Morris from Pensacola, Fla., fouled at the start. Hite had a .049 reaction time and posted a run of 7.915 seconds at 80.02 mph. After red-lighting, Morris raced down the track in 7.899 seconds at 82.16 mph. Maddie Chesne from Simmesport, La., won on a holeshot in the Advanced class. 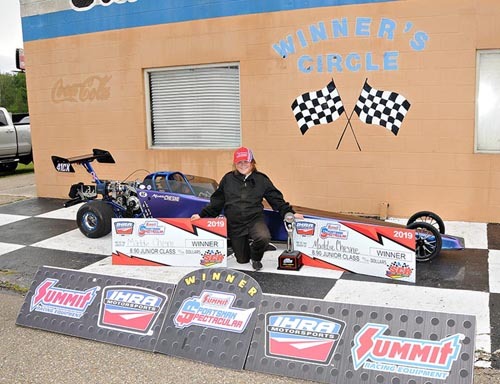 Chesne's run of 9.216 seconds at 71.61 mph with a .049 reaction time bested the package of 9.006 seconds at 70.88 mph and a .089 reaction by runner-up Layne Lewis from Sauicier, Miss. 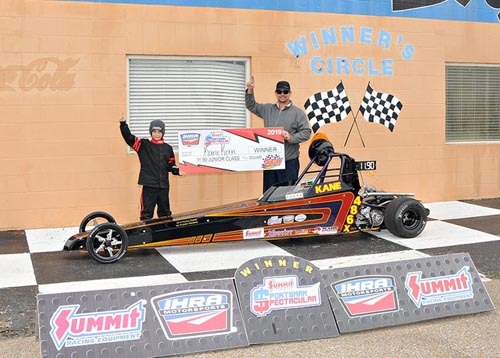 In the Beginners division for the youngest racers, Kane Kern from Pierre Part, La., had the winning combination of 12.040 seconds at 50.49 mph with a .142 reaction time. 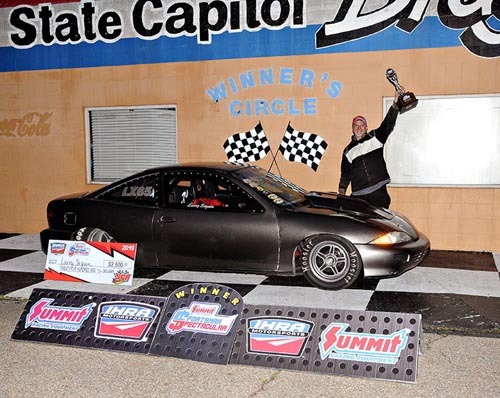 Runner-up Slade Olinde from Meraux, La., had a .037 reaction time, and then went 12.561 seconds at 50.33 mph. The race also featured a Junior Ironman run-off where Chesne took top honors with a run of 9.205 seconds at 71.56 mph and a .070 reaction time. Hite made it down the track in 7.964 seconds at 80.46 mph with a .061 reaction time. Chesne's winning ways started on Saturday when she beat Kern in the Advanced final. Chesne was .059 at the tree and then went down the track in 9.125 seconds at 68.66 mph. Kern also recorded the weekend sweep, also beating Olinde in the Beginner final. He had a .109 reaction time to go along with a run of 12.060 seconds at 53.48 mph. Peyton Simoneaux from Napoleonville, La., won on a holeshot over Ayden Hyatt from Breaux Bridge, La., in the Masters division. Simoneaux had a .018 reaction time and then made an 8.172-second pass at 78.03 mph. The IHRA Summit Sportsman Spectacular returns May 17-19 at Dragway 42, West Salem Ohio.